Number / text -- this is simply a text, or number (if the entered value looks like a number). Calculated parameter -- a parameter calculated using an expression. Since parameters are global for project referring to field names in parameter expressions makes no sense and therefore not allowed. As of version 1.6 it's not possible to refer in expressions to other calculated parameters, only to non-calculated ones. Although this limitation will be relaxed in future versions. For convenience, all non-calculated parameters are prompted on full runs -- i.e. when all project transformations have to be calculated (e.g. right after opening a project) or re-calculated (e.g. by pressing Reload and Run). Notice that parameter type can't be changed in Enter Parameters window. 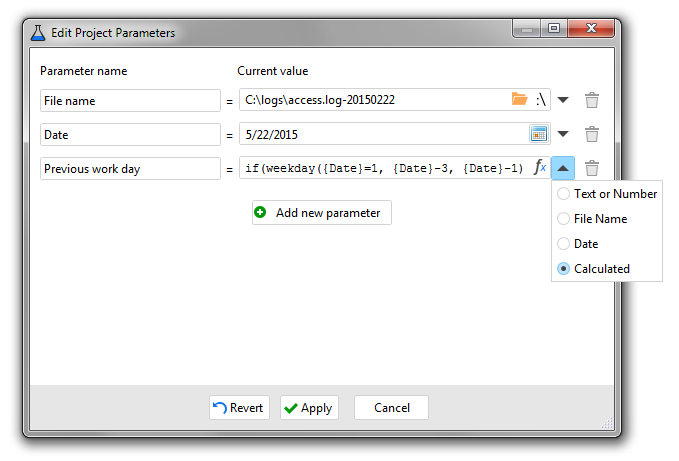 Parameter names and parameter values with spaces must be wrapped in double quotes. Special characters (if any) should be properly escaped. 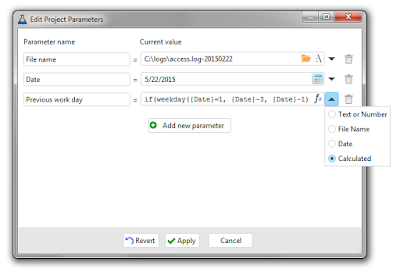 If a parameter is omitted then its default value is used. Calculated parameters can't be defined from command line. Parameters is also a cornerstone for iterations (loops), where parameters of a project are linked to fields of a table in another project and then the first project is executed once per every line of that table.